New to Twitter? Still learning how to build your following and engage existing followers? Twitter can be an incredibly useful tool, but it can easily become a wasted resource if you’re not using it correctly. Tweeting about your business is OK, as long as you’re doing so in moderation. As with all social media, Twitter is a medium for conversation. It’s important to be adding value to the general conversation. If you’re tweeting the latest piece of useful content or pertinent event information, your followers will know how great you are without your having to say it outright. Twitter moves quickly. As of June 2012, Twitter was at 400 million tweets per day. With that many tweets streaming through your followers’ Twitter feeds, there is a great chance your tweet will be missed. Many businesses try to combat this by repeating the same tweet 50 times per day. That is just too much repetition and your followers will grow tired of you. You want to make sure your followers are seeing your tweets, but you want to be cautious of too much repetition. If it’s a very important tweet and I want to make sure it is seen, I like to repeat it a couple times a day for a few days, but not much more. ReTweeting yourself equates to liking your own Facebook posts. We know you’re proud of the content you’re tweeting, you don’t need to retweet yourself to prove it. When you want to repeat a tweet, don’t be lazy. Find a new way to describe the content with each tweet. As I mentioned above, you can repeat tweets in moderation. Take the time to compose a new tweet when re-sending the same link from an earlier tweet. Don’t just retweet yourself over and over again or you will lose followers. Somebody finally mentioned your brand on Twitter! This can be very exciting. A common response is to just retweet the great thing someone said about you. In the real world, would you go around repeating the compliments you’ve received? Probably not. Apply this same rule when using Twitter. I would recommend that you reply to the person with a thank you and move-on. However, if you feel the mention contains content your followers might want to see, just make sure your retweet includes a thank you to the user who mentioned you. Too many hashtags in a tweet is distracting and ineffective. Your tweet will come off looking spammy and consequently will be ignored. You want people to actually read what you’re tweeting, right? Instead of stuffing your tweet with hashtags, pick one or two keywords that relate to your tweet and place those at the end with hashtags. I see this all the time. Businesses will tweet a question like, “How’s your day going?” First of all, Twitter only allows for 140 characters. How are your followers going to respond to such an open-ended question in so few characters? And, what’s the point of your question? You’re allowed to be casual and conversational on Twitter, but put some thought into the questions you want to ask and how you want to ask them. First, decide whether you want to keep things professional or be personal. Then, ask the questions that align with your Twitter strategy. When something big is happening to your business, it’s expected that you’ll be doing some extra tweeting. You could be ramping up your Twitter activity because you’re promoting an upcoming event, running a campaign, or publishing a white paper. A common mistake, however, is to be absent from Twitter 80% of the year and then only show up when you have something you need to promote. Twitter is active year-round and you should be too. Regardless of whether it’s a busy time of year for you or not, you can always maintain a regular stream of activity and engagement. Monitor feeds daily to participate in relevant conversations and re-share other’s useful content. That way, when it comes time to promote your own business, you can increase your activity and your followers will be more likely to help you spread the word. You’re busy. Your business is busy. You want to participate in social media, but you just don’t have the time. Enter the tweet scheduler. Numerous services allow you to schedule tweets ahead of time. This is a feature that can be very useful. I like to schedule tweets when I’m going on vacation or when there are a few things I want to make sure I promote in a timely manner. Using a tweet scheduler too often, however, can start to make you look like a robot. Even when you’re using Twitter in a professional capacity, your followers want to know there is a person behind the tweets. Schedule in moderation and inject some personality. Scheduling the same tweet for 10:01AM, 12:01PM, 2:01PM, and 4:01PM is a dead giveaway that you have relinquished your Twitter participation to a robot, and will hurt engagement. What could I possibly mean by tweet length? We’re already limited enough by the 140 characters, aren’t we? Often, taking up the entire 140 characters limits your followers in their ability to retweet you and add a comment of their own. When possible, leave some characters unused to enable people to add their own commentary, @mentions, and hashtags when retweeting your content. There is nothing more irritating than when you see an interesting tweet, click on the link, and find you’ve been taken to a completely unrelated page. We all want to see high click-through rates, high engagement, and large followings, but a misleading link description will only hurt your reputation. You can be engaging without misleading your followers by composing a tweet that both attracts attention and relates to the link you’re sending out. While there is no formula for Twitter success, avoiding some of these mistakes will certainly help you in your Twitter endeavors. What are some common Twitter mistakes you’ve seen? The post 10 Twitter Blunders Businesses Should Avoid appeared first on Small Business Trends. Energy stocks and funds have tanked this year and yet I carry on increasing my exposure to the sector. Am I being wilfully contrarian? A stuntman who was injured on the set of the action movie “Expendables 2″ during an October 2011 explosion in Bulgaria is suing for more than USD 25,000, according to a media report. According to court papers obtained by TheWrap, stuntman Nuo Sun filed his complaint in Los Angeles Superior Court on Thursday against Millennium Films and other entities involved with the production. His complaint says he was injured while filming a stunt on a rubber boat near the Ognyanovo Dam in Bulgaria, when an explosion occurred. Sun also says he has incurred medical expenses and suffered lost wages following the accident. Claiming negligence and liability, Sun is seeking general damages “in excess of USD 25,000,” plus medical expenses past, present and future, compensation for loss of earnings and income, plus the costs of the suit. The October 2011 explosion also killed another stuntman, 26-year-old Kun Liu. 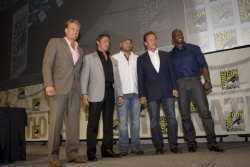 His parents filed suit against the “Expendables 2″ filmmakers in July. Kun Liu, 26, was a native of Beijing and his parents are suing for funeral and burial expenses as well as “the loss of society, love, comfort, attention, services and support” of their son. The Dutch Sinterklaas (St.Nicholas) will be visiting the Dutch and Belgium Children in Bulgaria ahead of his official birthday as celebrated according to the tradition of the Lowlands. 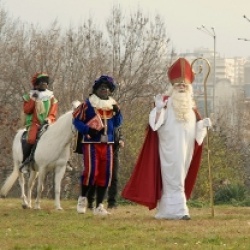 St.Nicholas will be accompanied by 5 Zwarte Piets, the Dutch Embassy in Sofia says in a press release. The arrival is scheduled for 10:30 am at the Best Western Expo Hotel on 149 Tsarigradsko Shose Blvd in Sofia. In order to promote this centuries old tradition also outside the capital city, a day later, on December 2nd, Sinterklaas will arrive by a ship in the Black Sea city of Burgas. At 10.30 am, accompanied by Zwarte Piet, Sinterklaas will arrive at the Burgas port where he will be welcomed by the Dutch Ambassador Karel van Kesteren and the Mayor of Burgas Dimitar Nikolov. The arrival will be followed by a camera and screened in Galleria Mall Bourgas, where Sinterklaas will go to entertain the kids of Burgas. The program is said to include a puppet show, games and various surprises. Israeli Ambassador in Sofia Shaul Kamisa-Raz on Friday thanked Bulgaria for its “principled position” in connection with Palestine’s bid to become a non-member observer State in the UN. As expected, the UN General Assembly voted Thursday evening to upgrade the Palestinian status. Bulgaria abstained from voting. In a statement sent to the Balkan country, Kamisa-Raz has noted that UN’s decision was “merely symbolic”, since the UN does not have the power to determine a country’s status or recognize countries. 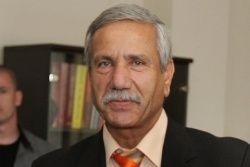 The ambassador has further pointed out that Palestine does not comply with the criteria for statehood, as it does not have an effective government. “The path to peace is between Jerusalem and Ramallah, and not through New York,” he has also declared, reiterating that peace could only be reached through direct dialogue between Israel and the Palestinians. The diplomat has thanked Bulgaria for being aware of all reasons why the Palestinian resolution should not be supported. On Thursday, Bulgarian Foreign Minister Nikolay Mladenov said the country’s decision to abstain from voting was based on a careful analysis of the draft resolution and the potential implications it would have on the prospects for the resumption of the Middle East peace process. “Bulgaria supports the legitimate demands of the Palestinian people for self-determination and was one of the first countries to recognise the State of Palestine in 1988,” Mladenov’s statement said. 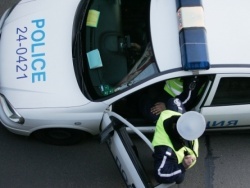 An armed robbery took place at the Central Dressing Factory in Bulgaria, with three robbers stealing some BGN 162 000 (nearly EUR 83 000) in salary money. The robbers were masked and armed with automatic rifles, witnesses say. They disarmed three security guards before entering the factory. They proceeded to threaten the cashier and disappear with the money. An Audi vehicle destroyed by fire was later discovered in a nearby forest. The iPhone is quickly becoming the “go to” gadget for fans of photography and video and many are now using these features for business and marketing purposes. Enter Grant Wicks, a.k.a. 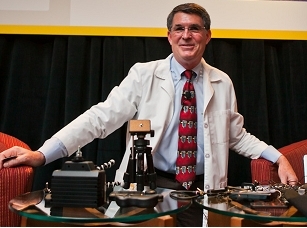 “Professor Gadget,” Vice President of Business Development for Wasp Barcode Technologies and a Top 100 SMB Influencer. Grant has sourced many useful gadgets and turned his iPhone into a one man media studio for conducting on-the-go interviews. Tune in as he joins Brent Leary to share some of these special finds so that you, too, can make the best use of the iPhone for business. Small Business Trends: Can you tell us a little bit about yourself and your background? Grant Wickes: I’ve been steeped in the technology world for 25, almost 30 years. It has always been on the marketing and sales side of things with software companies. Small Business Trends: What compelled you to get into “interview mode” at conferences? To find all of these cools tools to turn your iPhone into a full blown production kit? Grant Wickes: I don’t come from T.V. I don’t come from radio. I am not a big expert on these things. But I have a passion to interact with folks. As you said, going around to the various conferences. I like to take photographs. I have all of the high end equipment, a big Cannon Digital SLR, with all the big lenses, which is fantastic. But I don’t want to bring all of that stuff with me on the road. Then the iPhone came out and it really became an interesting platform. I collapsed it down and found the iPhone really became the platform for me to be able to do photography. I got into it, this thing is a fantastic video machine. So I did not have to bother with the camcorder any more. Small Business Trends: Can you talk about how you make them look good and sound great using the iPhone? Grant Wickes: Sound is something people will not tolerate if there’s crackling. The iPhone has a built in microphone, but honestly, it’s just a cheap little mic inside the phone. With a little research, now you can get adaptable microphones. There is one by Belkin that’s called an iPhone Boom Mic that plugs right into your ear piece for the iPhone and sticks out about 4 or 5 inches and I can go around talking to people. The second approach is the little lavalier mic that all the T.V. guys put on their collar. There is an adaptable unit from Audio Technica for $20. I can get a lavalier mic with a 20 foot cord, with another little $20 adapter that converts into the iPhone plug in. Now I have studio quality sound for an interview. The other one, the Boom Mike, was around $40. Small Business Trends: How do you get great lighting from a picture you take from your iPhone? Grant Wickes: If you are out at an event or in a spot, you look for natural light. It is always the best approach. If I can get an outdoor setting where the sun is in the back, or if I can get an indoor sitting area that has a glass enclosure where outside light is coming in, that is always superb to do that. But let’s face it, we don’t always have that luxury. For $30 for both, I have bought a couple of different LED lights. These things are small little white lights I turn on. I have a bracket I can fit on the iPhone so that the light now shoots off to the side. It hangs out to the right side of the iPhone. Because one of the things you try to avoid with light is having it directly in someone’s face. An iPhone with this little case for $23, with a $13 extension heading out there, with a $30 LED light, and $30 microphone, and I’ve got gadgets on the go. I have studio quality on a shoe string budget. I have these little gadgets in my bag. I can immediately have a quick conversation, it leads to an interesting discussion. Within less than five minutes, I am up and running. In less than ten minutes, you and I have finished the conversation. I have content that I can put up and share with my customers, or clients, or business prospects. Small Business Trends: Did you see any difference, in terms of views or clicks, in the way people perceived the content? Grant Wickes: There is no doubt. The good old days where you can have your flip cam and all of that noise in the background – that’s really not acceptable anymore. So I do see it. I see it through Google Analytics the continued use and sharing of these video snippets that I take. Small Business Trends: Where can people see these tips that you have talked about? Grant Wickes: I am putting up a robust set on my Pinterest. Small Business Trends: Where can people find some of these tools and these little gadgets? Grant Wickes: There are two primary places I go for my gadgets. One is called Photojojo. They are a fantastic little gadgets spot for iPhones. Another is B&H Photo Video. It’s based in New York and is a store for photography. They have all of these little gadgets I’ve picked up. I didn’t even talk to you about the 8x zoom lens I got from Photojojo to do shots. So we have to talk again Brent. There’s too much stuff to share with everyone in a short amount of time. Small Business Trends: Since you mentioned that, what is that called? Grant Wickes: That one is iPhone Lens by Photojojo. It is an 8x lens. Now they have one for the iPhone 5 that takes you 12x. So it is like having a 600mm lens on your iPhone. It is $35. It’s just fantastic! The post Grant Wickes, aka Professor Gadget: Using iPhone Photo and Video for Business appeared first on Small Business Trends. The eurozone’s unemployment rate hit a new record high in October, while consumer price rises slowed sharply. Inflation fell from 2.5% to 2.2% in November. “The real problem is that we have a two-speed Europe,” economist Alberto Gallo of Royal Bank of Scotland told the BBC. 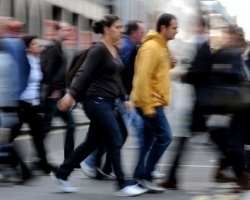 “The biggest increase in unemployment is being driven by Italy and Spain. 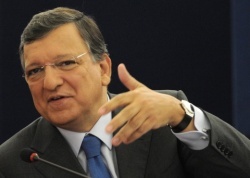 Moldova is on its way to ink agreements on association and free trade with EU in 2013, European Commission president Jose Manuel Barroso said on Friday. “If Moldova goes on with the reforms and achievements it has demonstrated so far in the Eastern Partnership programme, your country may count on signing three important documents with the EU by the end of 2013,” Barroso revealed after meeting Moldovan Prime Minister Vlad Filat in Chisinau. The European Commission president clarified that the agreements will be on establishing an EU-Moldova free trade area, on Moldova’s association with the EU, and on the second phase in the action plan on visa liberalisation. He noted that EU’s financial support to Moldova has increased fivefold in the last six years, from EUR 25 M in 2006 to EUR 122 M in 2012. You are currently browsing the Business, finances, forex blog archives for November, 2012.